I think what I have here is Gardenia jasminoides. It also known as Cape Jasmine or Cape Jessamine, derived from the earlier belief that the flower originated in Cape of Good Hope, South Africa. Malays call this flower as bunga cina. 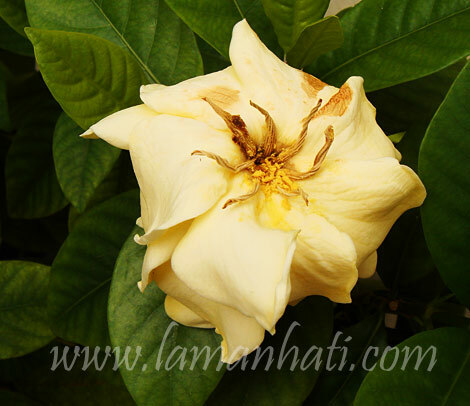 Gardenia jasminoides is a shrub with greyish bark and dark green shiny leaves with prominent veins. The white flowers bloom in spring and summer and are highly fragrant. They are followed by small oval fruit. I have been waiting for it to bloom again after her last bloom in 2007. There were many times that I’ve seen buds coming out but none manage to make it to bloom until last week. I’ve read somewhere that “bud drop” is the common problem with gardenia. 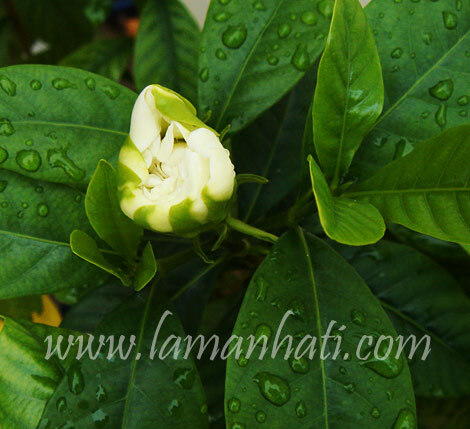 The most irritating problem encountered with gardenias is “bud drop,”when flower buds abort just before blooming. Common causes include low humidity, over-watering, under-watering, insufficient light high temperatures, rapid temperature fluctuations, cold drafts or change in plant locations. In other words, gardenias are temperamental! A fertilizer designed for azaleas will also fill the nutritional requirements of your gardenias. 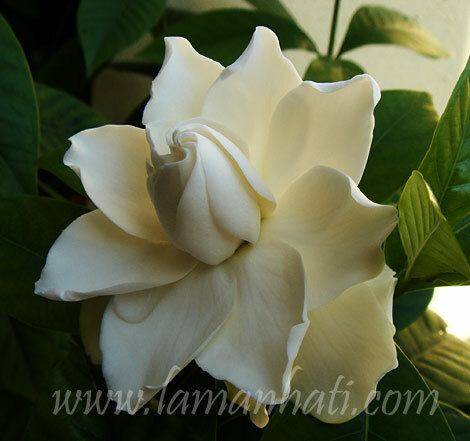 Be sure to prune older gardenia stems right after the flowers stop blooming. This encourages new growth as well as more frequent blooming. This was the first gardenia that bloomed last week. I was too busy to take picture and when I managed to find the time, it was withering away. Hopefully more buds will coming out soon. Next time when I go to ACE hardware, I will check for azalea fertilizer. I am linking up the fact sheet about Gardenia care from University of Rhode Island Landscape Horticulture Program in case I need to read about common problems in planting gardenia in the future.